Kingston Blinds are a family run company who make and fit made to measure blinds in Oxford, Didcot, Witney, Kidlington, Wantage, Wallingford, Thame, Abingdon, Watlington, Reading, Newbury, Bicester, Banbury & the surrounding areas. 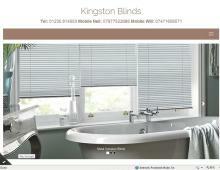 Kingston Blinds pride themselves on offering customer service with a personal touch and give attention to their clients needs. Kingston Blinds offer a free quotation and fitting service for awnings and blinds across Didcot, Oxford, Oxfordshire.and surrounding areas.